Beautifully written works for parishes large and small from Stephen Dean, arguably one of the best modern composers in the English choral tradition. Stephen Dean knows how good it is for parishes to explore new and challenging music outside their familiar repertoire. It helps the entire community to grow -- musically and spiritually. Holy Gifts, his latest collection, gathers 16 of his best new songs from the past ten years. Written in a style that's both accessible and adventurous, the songs cover Christmas, Palm Sunday, Holy Thursday, Pentecost and Ordinary Time. Cantors and choirs will find arrangements that are intricate and rewarding. Accompaniment is primarily piano or organ, with splendid parts for woodwinds, brass and strings. The collection includes hymns, three responsorial psalms, a Gospel acclamation and music for the Liturgy of the Hours and the sacraments. A versatile piece for Holy Thursday, "Faith, Hope and Love" offers the choice of two texts, original verses by Stephen and the traditional "Ubi Caritas." Inspired by the idea of sancta sanctis, "holy things (or gifts) for holy people," from eastern liturgies, the title song is a gorgeous processional chant for Communion. Other highlights include "May Love Be Ours," with text by Timothy Dudley Smith, and "Only the Shepherds," a Christmas song set to a lovely Catalan folk melody. 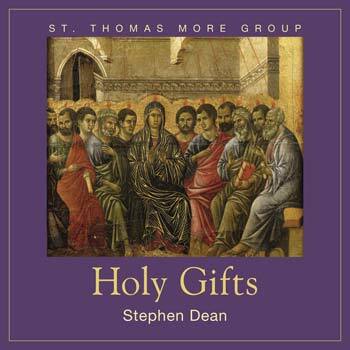 A founding member of the St. Thomas More Group, Stephen Dean is one of the best modern composers in the English choral tradition. Holy Gifts will bless the cathedrals and small parishes that welcome these beautifully written new works into their repertoire. Stephen Dean knows how good it is for parishes to explore new and challenging music outside their familiar repertoire. It helps the entire community to grow—musically and spiritually. Written in a style that's both accessible and adventurous, the songs on Holy Gifts cover Christmas, Palm Sunday, Holy Thursday, Pentecost and Ordinary Time. Cantors and choirs will find arrangements that are intricate and rewarding. Accompaniment is primarily piano or organ, with splendid parts for woodwinds, brass and strings. A founding member of the St. Thomas More Group, Stephen Dean is one of the best modern composers in the English choral tradition. Holy Gifts will bless the cathedrals and small parishes alike as they welcome these beautifully written works into their repertoire.